RISAFoot provides stand-alone and integrated analysis, plus design and drawing of spread footings and pedestals. RISAFoot is the best because it automates every step from analysis to design to drawing and it goes beyond simple issues to handle complex situations, such as biaxial bending, uplift and property boundaries. Automatically check bearing pressure, sliding, overturning, and uplift. Designs both footing reinforcement (bottom and top) and pedestal steel and exports DXF details. View detailed reports for each footing, including bearing pressure plots and reinforcement sketches. RISAFoot will create DXF plans, sections, and details of your footing for export to your favorite CAD package. RISAFoot is the complete solution for individual spread footings. RISAFoot allows you to define your own load combinations, including bi-axial loads and bearing increase factors. When architectural constraints require a shift, you can directly specify the required eccentricities. Even handle lot lines and utilities by specifying a fixed distance from a column – in both directions. RISAFoot handles all the standard serviceability checks: bearing pressure, sliding, overturning, and uplift. RISAFoot automatically sizes each footing, and then designs both the footing and pedestal using the latest ACI codes. You get layouts for both top and bottom footing reinforcement, as well as main steel and ties in the pedestal. Apply vertical loads, shears, and moments, in both directions simultaneously. Self weight and overburden are calculated automatically. Calculate exact biaxial soil bearing distributions using advanced computational methods. Determine the optimum footing length, width and thickness to satisfy soil bearing, bending, shear, uplift, and boundary criteria. Create a full pedestal design for axial loads, biaxial bending and shear with specific results for longitudinal bars, development and ties. Separate load contributions for overturning and stabilizing forces satisfy the desired safety factor. Sliding checks verify that the applied forces can be resisted by the calculated soil friction force and user-defined passive soil resistance. 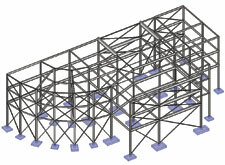 Full integration with RISA-2D, RISA-3D and the RISA Building System brings productivity to a higher level. Manage all project footings in one model, in one file, and within the same environment as your structure. All loads are automatically applied and all footings are optimized at once! Changes can literally be handled in minutes rather than hours or days, letting you investigate more design options and helping you adjust on fast-track projects. Detailed foundation plans are automatically generated in seconds. As stand-alone software RISAFoot quickly gives you accurate designs and details for single footings. The stand-alone interface makes it easy to get the results you need. Real spreadsheets with cut, paste, fill, math, sort, find, etc. assist with input and results. Footings are optimized for geometry limits and many other criteria that you define. All loading combinations of axial, shear and moment are solved with exact solutions, including biaxial bending with or without uplift. Eccentric pedestal locations may be defined, offset in one or both directions. Property boundaries may be defined for RISAFoot to determine optimum footing-pedestal layouts. Net or Gross allowable soil bearing may be specified. RISAFoot calculates the exact soil bearing distribution under the most complex loading and determines the optimal footprint. Automatic calculation of overburden and self weight of footing and pedestal. Sliding checks are performed with user defined friction coefficients and passive resistance. The footing is fully designed for bending, one-way shear and punching shear. Pedestals are designed for axial, shear and bending, including biaxial bending. Designs, including reinforcing and stirrup requirements, are fully detailed and may be exported for incorporation into CAD drawings. Overturning safety factors are maintained and may also be customized by the user. Moments and restoring forces are also reported. High quality graphic detail reports, with stress diagrams and detailed calculations, print what you see on screen and are easily customized. Constant in-stream error checking and data validation prevent user errors. Support for all units systems and conversions at any time let you freely change between any systems.